Step back in time… Braemar Castle! Home > Visitor Attractions > Step back in time… Braemar Castle! The Cairngorms National Park is blessed with an abundance of history, culture and fascinating facts. Yet it’s the people who live here and care for the region that often amaze us more than anything. Many that spend their time here, and have chosen to make it their home, have a real sense of place and love for the area that manifests itself in protecting the landscape, wildlife, buildings and culture. This month What’s On caught up with one such group of people in Braemar dedicated to preserving the past for the future. 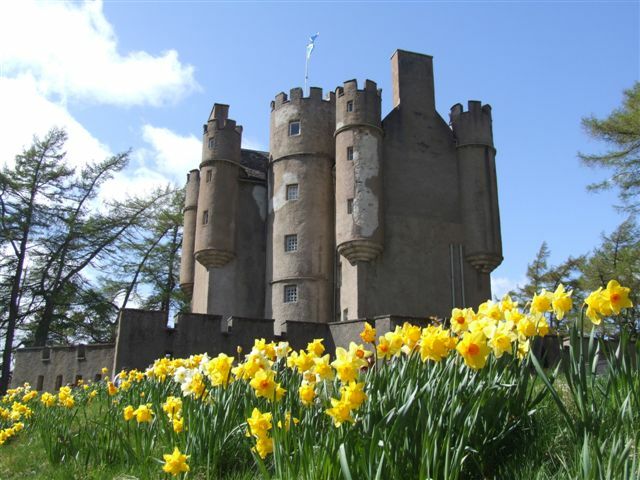 Arguably one of the most spectacular castles in Scotland, Braemar Castle allows visitors to step back in time to hear stories of the colourful characters associated with the castle. So, what’s the history of this special building? Well, like any castle Braemar’s history is long and sometimes complicated, but it has played a massive part in Scotland’s story. Clan Farquharson, lead by the bold John Farquharson, was staunchly against the Union of Crowns and its supporters, so he burnt Braemar Castle to ruins in 1689. It was initially thought that the castle was burned so badly that it was no longer inhabitable, however there is some evidence that the ground floor may have been used during this period with just the roof and rafters damaged in the blaze. Jump forward to 1746 and the Castle became a safe garrison for the Hanovarian troops after the Battle of Culloden. The Castle underwent an extensive refurbishment programme to bring it up to standard as military quarters. In fact troops were regularly garrisoned at the Castle until the early 1800s and it wasn’t until 1831 that the Castle was refurbished back to a family home. By the 1800s Deeside had become established as “Royal Deeside” following the decision of Queen Victoria and Prince Albert to buy the nearby Balmoral Castle. The royal couple regularly went to the Braemar Gathering, which was held in the grounds of Braemar Castle and took tea in the drawing room with the Farquharsons – who were now residing in the Castle. In the intervening years many things have happened to the Castle, but what about now? Well, the Castle was first opened to visitors in the 1960’s yet had to close in 2004 due to poor health of the ground manager. However, keen to resurrect it’s importance, the local community pulled together not wanting the Castle to lose it’s future after having such an important role in the past. A plan was forged with the Farquharsons for the Castle to be leased for 50 years to the village of Braemar and managed by a charity, Braemar Community Limited and in February 2007, the keys were handed over to the charity. However, this 350-year-old building was in dire need of some TLC. Sadly, some areas of the Castle were beyond repair and had to be removed from the Castle in order for the attraction to be re-opened to the public. So a dedicated band of volunteers spent 2007 making the Castle safe and welcome for the first new visitors in May 2008. Since then the Castle has become one of the leading attractions in the east side of the Cairngorms National Park. It played centre stage at the Disney/Pixar Brave celebrations in 2012 and the community, charity and dedicated fans of the Castle work continuously to keep this historic building on the map. However, as with any old building there is still preserving and protection work to be done… The roof needs repaired, the walls need re-harled, the interior decor needs both conserved and refurbished and additional facilities are now needed to welcome even more visitors. With ambitious plans to bring Braemar Castle up to the standards expected in the 21st century with a brand new visitor centre with kitchen, cafe and proper toilets planned for the near future, the race is on to raise the £2 million needed for the work. Braemar Castle is a fascinating place to visit. It is a secret gem not to be missed and perfect for a family day out. Packed full of history, legends and magic all set within stunning scenery you’ll not be disappointed. Whilst there be sure to keep a look out for red deer, red squirrels, golden eagles and, if you’re very lucky, the elusive capercaillie.